In any genre. Writer becomes when the needs disappear – needs like expression or dialogue, understanding or inquiry. The need to devise layers or multiples of perspective, to experiment or experience language or thought. To love. 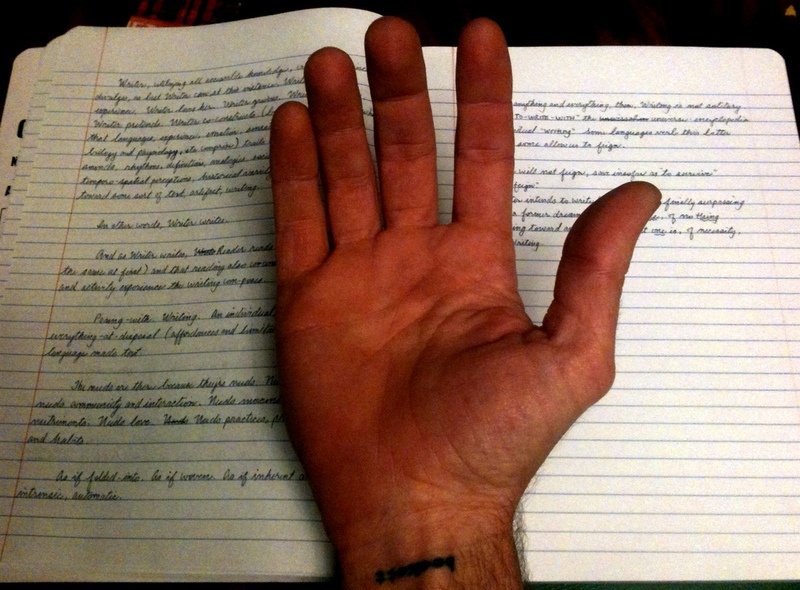 When these needs are expunged or exhausted, and a human puts pen or pencil to page, writing might begin. These needs are not expunged. Maybe they find a more suitable object, event, or entity. Writer attempts to construct love via language and page. This is also dialogue. But what is needed is resonance-WITH. What is longed for are moments of positive resonance with an other of Writer’s same kind. Where resonance would be acceptance, acknowledgment, empathy. Comprehension, understanding, attunement with Writer’s barest, most authentic expressions – Writer’s openness and risk, Writer’s life-experiencing, meaning-making processes. Writer, utilizing all accessible knowledge, craft and experience divulges (as best Writer can at this instant) Writer’s lived experience. Writer loves her. Writer grieves. Writer imagines. Writer pretends. Writer co-constructs (borrowing from the everywhere that language, experience, emotion, sensation, cognition, DNA, biology, physiology, dimensions etc. comprise) trails of letters, incipient sounds, rhythms, definitions, analogies and metaphors, socio-cultural baggage, spatio-temporal perceptions, historical variety and habitudes, toward some sort of text, artifact, writing. In other words, Writer writes. And as Writer writes, Reader reads (they are one and the same initially) and that reading also co-constructs the divulgence and activity-experience the writing com-poses. Posing-with = Writing. An individual, posing-with, everything-at-disposal (its affordances and limitations) through language-inscribed. present or constitute (a problem, danger, or difficulty). assume a particular attitude or position in order to be photographed, painted, or drawn. a particular way of standing or sitting, usually adopted for effect or in order to be photographed, painted, or drawn. a particular way of behaving adopted in order to give others a false impression or to impress others. As if folded-into. As if woven. As if inherent and intrinsic, automatic. As of anything and everything, then, Writing is not solitary. “To write” is TO-WRITE-WITH the universe-encyclopedia of said individual, “writing.” Some languages verb this better than others, some will allow us to feign. Writer intends to write-with, perhaps finally surpassing a former dream of being no one, no thing, instead edging toward and everything that one is, of necessity, Writing. That is a mesmerizing photo…the nearly exaggerated opposable thumb manifests (Lo!) the humanity of the prose beautifully. The paragraph: ”And as Writer writes, Reader reads (they are one and the same initially) and that reading also co-constructs the divulgence and activity-experience the writing com-poses.” … in the visual arts the artworks of whatever form, is recreated even to nth degree by each viewer. The same then with reading; it’s a matter of perception, and the ‘baggage’, usually cultural, that one reads with, views with. indeed. and that first “reader/viewer” is almost simultaneous to and influences perhaps equally the writing/creating, as it IS whomever is creating in whatever form!